Tombili — a fat and friendly cat from Istanbul who went viral because of a photo of him lounging on the sidewalk like a tiny, chill human — passed away back in August. 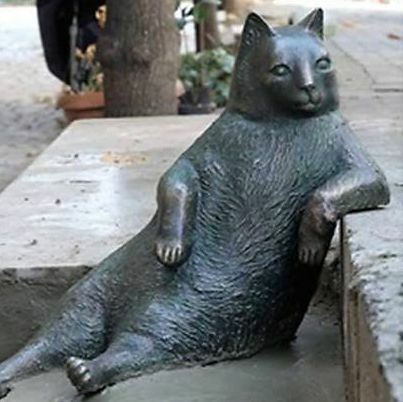 After his death, locals hung a sign that read “You will live on in our hearts,” and now, thanks to a successful Change.org campaign, that promise will be tangibly fulfilled: Tombili will be immortalized in a mostly realistic, slightly haunting statue depicting the pose that made him famous. The sculpture will be inaugurated on October 4, which is also World Animal Day. 4 Ekim Hayvanları Koruma Günü Kutlu Olsun! Rest in peace, big guy.